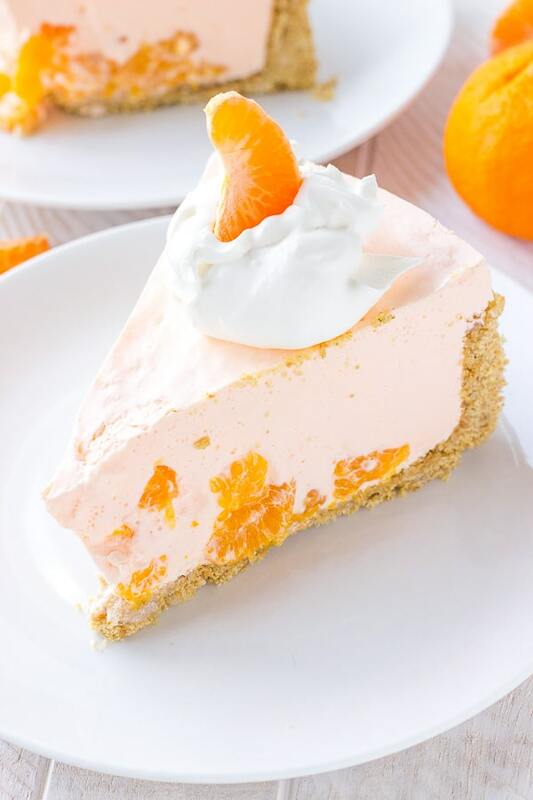 This No Bake Orange Cream Pie is super simple, delicious and absolutely worth every single bite! When it comes to baking in the summer, I tend to get a little uninterested. Not because I don’t want to eat (c’mon! ), but because of the thought of cranking up that oven to get the heat high enough to be able to actually bake. It’s already super hot and humid outside so the last thing I want to do is make the inside of the house even hotter! 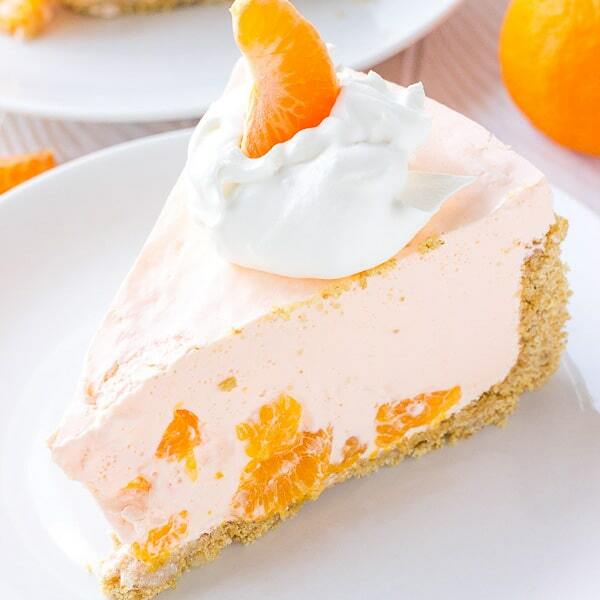 With this No Bake Orange Cream Pie, my worry is gone. Not only does this pie take just 10 minutes (yes, only 10!!!) to prep, it’s one of those flavors that just taste totally explosive to your taste buds. 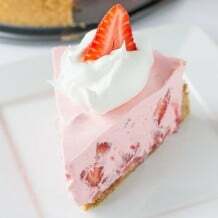 With this pie, each and every bite is a cool, refreshing treat. 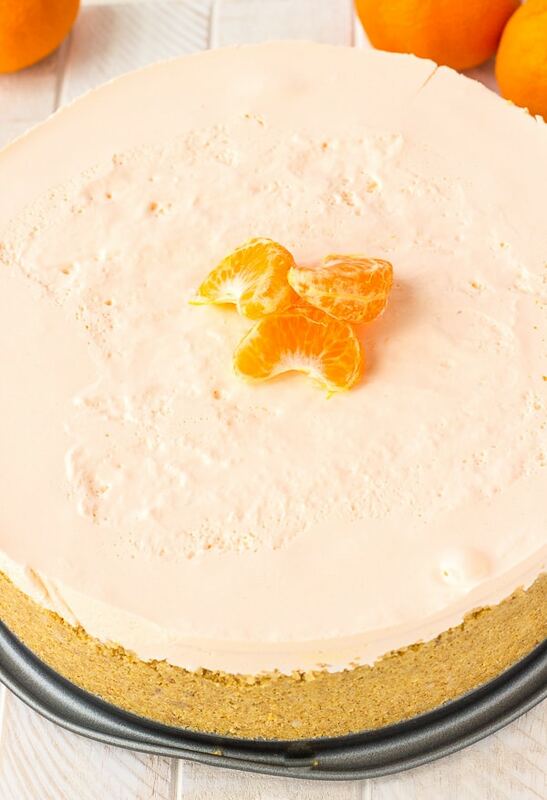 The duo of the graham cracker crust and the mandarin oranges is seriously amazing. And then to top it off with a dollop of whipped cream? You’ll find yourself “sampling” this pie filling along the way as you’re making it…trust me. After all, you have to make certain it tastes just perfect! 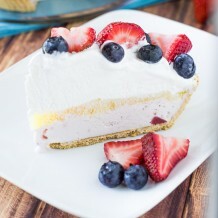 Get ready to create the pie that is certain to be the hit of your summer dessert creations. 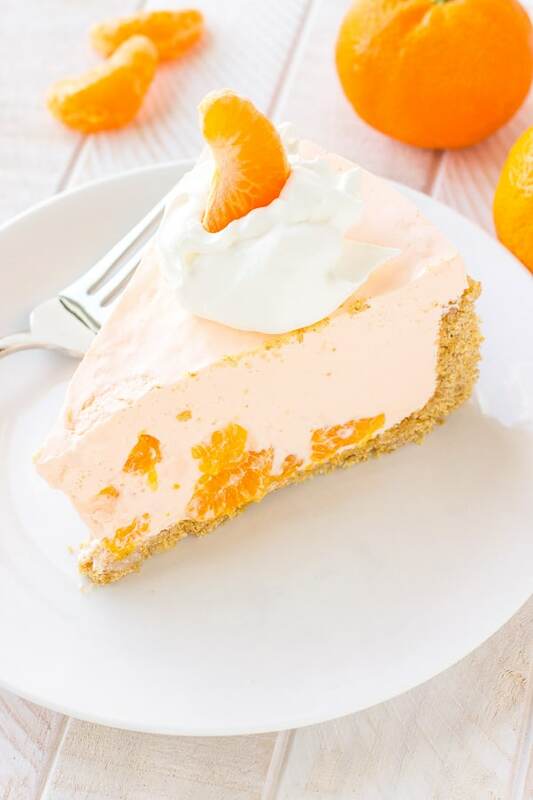 You and your friends won’t be able to get enough of this No Bake Orange Cream Pie! NO-BAKE GRAHAM CRACKER CRUST: An easy way to press the crust into the spring-form pan is to use the bottom of a measuring cup to pack down the crust into the pan. Also, the key to a great no-bake graham cracker crust is letting it refrigerate for at least 30 minutes before topping it with the pie filling. LET THE JELL-O SET: When you make the jello, it’s super IMPORTANT to let the jello set for about 10 minutes before you add the cool whip. If you don’t let the jello set, the pie will NOT set up and it will be very runny. HAVE LEFTOVERS OR WANT TO MAKE THIS PIE AHEAD OF TIME? 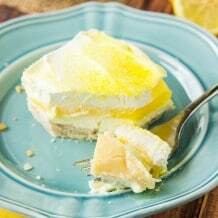 : No problem, this pie can be made ahead of time and if you have leftovers, just place the pie back in the refrigerator and cover with parchment paper/wax paper. This pie will stay fresh for up to 3 days! Press graham cracker crust into a 9-inch spring-form pan. Place pie crust in refrigerator. In a large bowl, add boiling water and gelatin powder. Whisk gelatin powder until completely dissolved.Then, add ½ cup cold water and ½ cup ice cubes, whisk until gelatin is slightly thickened. TIP: Let the gelatin mixture sit for 10 minutes to thicken slightly before you add the cool whip otherwise it won’t set up. Add cool whip topping to gelatin mixture and whisk together until light and fluffy. Stir in mandarin oranges. Refrigerate for 30 minutes or until mixture has thickened. Add orange pie filling to pie crust. Refrigerate for up to 6 hours or until firm. Top with cool whip and enjoy!